Lionel George Edens was born at 11 Leckford Road, Oxford on 6 November 1896. His father George Edens was born in Wardington in 1871, and in 1891 when he was aged 19 he was working as an assistant to the Oxford Professor of Geology and living with his parents at 33 New Inn Hall Street, where they kept a loding house. Just before his marriage in 1895 he he moved to a house of his own at 11 Leckford Road (then in SS Philip & James parish). Lionel's mother Emma Mary Maycock was born in St Ebbe’s and baptised at Holy Trinity Church there on 26 April 1871. At the time of the 1891 census she was living with her parents at 38 Plantation Road. Sylvia Edens (born in St Margaret’s parish, Oxford in 1908/9 and baptised at St Margaret’s Church on 3 February 1909). Lionel's parents remained at 11 Leckford Road until about 1899, when they moved with him to 81 Kingston Road in St Margaret’s parish. They were there at the time of the 1901 census, and Lionel’s father was described as a clerk. Lionel was educated first at Bedford House School in Walton Street. In January 1906 he moved on to the City of Oxford High School for Boys in George Street: he was the first son of an old boy to be educated at the school. 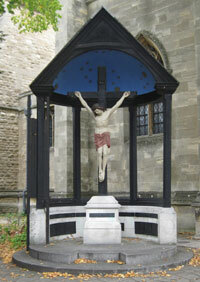 He was also a choirboy at St John’s College from the age of 14 to 16. When applying for a commission in July 1915, the Headmaster of the Boys' High School, A. W. Cave certified to Lionel's “good moral character” for the period 1905 to 1915, and N. A. James, President of St John's College, for the period from January 1910 to June 1913. At the time of the 1911 census Lionel (14) was still at school and living at 81 Kingston Road with his father George (39), who was now described as “Clerk to the University Extension Delegacy and Organist”, his mother Emma (40), and his sisters Phyllis (10) and Sylvia (2), plus their 16-year-old servant girl. 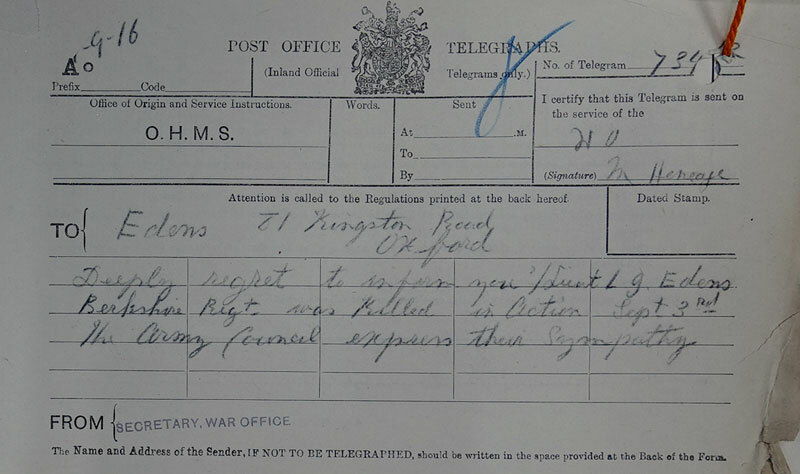 When war broke out Lionel had been working for a short time with Messrs Linnell & Murphy, solicitors, and had hoped to be articled to the firm. 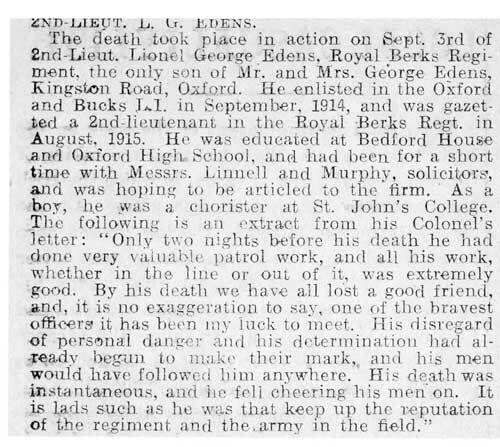 In the First World War Lionel George Edens enlisted as a Private in the 4th (Reserve) Battalion of the Oxford & Buckinghamshire Light Infantry (Service No. 3221) on 19 September 1914, when he was 18 years old. He served on the home front until 26 August 1915, when he was gazetted Second Lieutenant in the 8th Battalion of the Royal Berkshire Regiment. 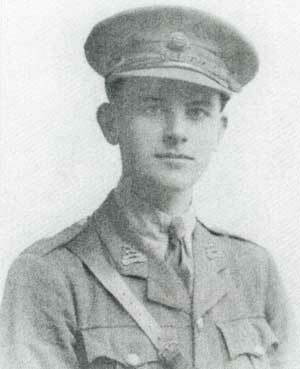 He was killed in action in France at the age of 19 on 3 September 1916. He is buried at the Thistle Dump Cemetery, High Wood, Longueval (B.12). Edens is remembered on a plaque in the Old Boys’ High School, George Street (left) and on the war memorial outside St Margaret’s Church in north Oxford. Phyllis Edens (born 1900) married John Edward Richards at St Margaret’s Church on 24 April 1943. She was living with her parents and working as a school teacher, and he was a civil servant who lived at 31 Southmoor Road. Phyllis died in Oxford in 1995. Sylvia Edens (born 1908/9) married Ronald Alfred Johnson at St Margaret’s Church in the first quarter of 1945. She was then living at home and working as a secretary, and Ronald, who was a clerk of works, lived at 4 Bainton Road. Ronald died at the age of 59 and was buried in Wolvercote Cemetery on 17 February 1948, and Sylvia died at the age of 96 and was buried with him on 3 February 2005.